This propellant has been a secret of OEM loaders for some time. It is the cleanest .223 and .308 spherical propellant on the market, and a superior alternative to H335 and BLC(2). Optimized for 55 grain .223 Remington, and 147/150 grain .308 Winchester, it also provides sub-minute accuracy with numerous match loads we’ve evaluated. It is extremely low in residue, muzzle smoke, and is flash suppressed. The propellant flows like water through a volumetric charger. Loaders will see no more than 1/10th of a grain of variation in charge weight from a powder drop. This has been tested in Dillon, RCBS, Lee, Hornady, Hollywood, and Lyman chargers. Additionally, this propellant enables loaders to meet the velocity and pressure specifications of popular rounds for AR and M1A platforms. It provides ample gas pressure and volume for reliable cycling of these operating mechanisms. Technical support of this propellant is available upon request. Please note: Shooters World has standardized D073-01 (originally an OEM propellant), for use as a canister propellant. This standardization required us to amend the manufacturing specifications. With this amendment, we had to change the name. Thus, new D073-01 will be now called D073-08 and Tactical Rifle. As with any propellant and load combination, a minor change to any of the components of the test load CAN result in significant shift in ballistic performance. This shift can cause unintended high pressures, and result in injury or death. 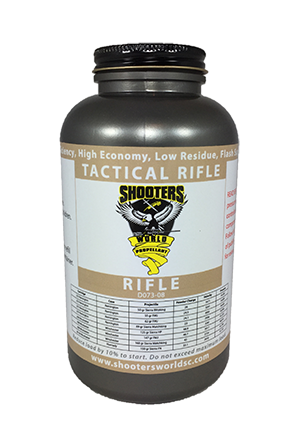 Therefore, Shooters World LLC, nor the manufacturer of this propellant take no responsibility for the intentional or unintentional misuse of this product. The charge weight noted above is NOT recommended, either as a starting nor completed load. It is shown merely as an indication of potential performance in one test load, shot by CIP standards.